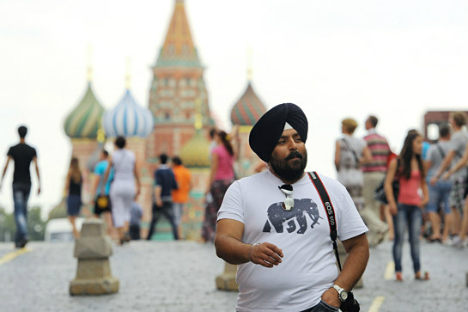 Chinese, Indians and Iranians are among those who travel most as tourists to Russia. The three Asian countries have emerged as the most promising areas for development of tourist travel to Russia. With tourist traffic to Russia from the west gradually declining, China, India and Iran have emerged as the countries which send most tour groups and tourists to the country, the Interfax-Tourism portal said, citing Irina Tyurina, spokesperson for the Russian Union of Travel Industry (RUTI). “The trend of reduced tourist travel from European countries, and intermittent growth from eastern countries, started being observed at least three or four years ago. This season, the east has become a clear winner. Organized travel to Russia by tour groups is growing only from this direction. The leading position is occupied by China, which is followed by Iran and India, said Tyurina. She noted however, that Russia is not among the top ten most popular destinations for the Chinese traveller, though the number of tourists from China is rapidly rising. “In the first six months of this year, 160,000 Chinese tourists visited Russia using the visa-free travel regime, which is two times more than in the same period last year. The majority of visitors head for Moscow and St. Petersburg. During this period, 103,000 Chinese visited these two cities, as participants in group tours, whereas one year ago, this figure was less than 45,000,” said Tyurina. The NTK Intourist Company also noted that the flow of Chinese tourists to Russia this year has grown three times compared to last year. Russia has become a popular destination for the Chinese for three reasons, which happened simultaneously; the significant depreciation of the ruble, rising incomes of the Chinese themselves, and favourable prices for accommodation in Russian hotels, the company said. The KMP Group pointed out that the ruble’s depreciation has led to a growth in travel to Russian regions bordering China, where Chinese residents go to do their shopping. According to statistics, Chinese tourists allocate around 60 percent of their travel budgets to shopping. Also, while Chinese tourists would earlier focus on the cheapest accommodation options, today their preferences have shifted towards the higher-end, starred hotels. Russian tour operators believe India is another promising inbound tourism market. This market has been poorly developed so far, primarily because of difficulties in collaborating with local tour companies, and because of difficulties in getting Russian visas. Analysts believe that if Russia simplifies visa regulations for Indians, the number of tourists from India will increase significantly. The number of Iranians travelling to Russia is also steadily increasing. This year, Intourist has started operating charter flights from Tehran to Moscow, with departures twice each week, while SVOY Travel Services operates four weekly charter flights from Tehran to Moscow and two from Tehran to Sochi. The most popular cities for visiting Iranians are Moscow and St. Petersburg, which tourists can easily reach on regular flights from Tehran. According to Russian Federal Border Guard Service figures, a little more than 1,200 Iranians visited Russia in the first quarter of 2015. Yet, according to the forecasts of tour operators, Russia can expect to receive around 60,000 tourists from Iran annually.